Compatibility:This part will only compatible with an iPhone 6 Plus, but not an iPhone 6, 6s or 6s Plus. Please make sure you identify your iPhone correctly before purchase. 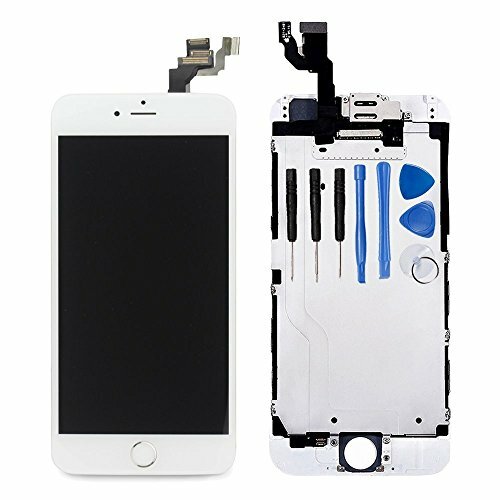 - This part includes the home button, front facing camera, earpiece speaker, and the LCD shield plate. - You will not need to transfer these parts from your old display assembly to your new part. - The Touch ID function will only work with your phone's original home button assembly. You will need to transfer the button assembly from your old display to retain Touch ID. - Please search "iPhone 6 Plus front panel replacement" on YouTube for a video instruction of how to do the replacement. This part comes with the iPhone 6 Plus homebutton, speaker, front facing camera, and the cables attaching to them, which means you don't need to transfer them from your old screen onto this new one. The Touch ID function will only work with your phone's original home button assembly. You will need to transfer the button assembly from your old display to retain Touch ID.